Up here in my good ol' state of Maine I look forward to autumn every year. It seriously is just gorgeous! If you ever get a chance to come to Maine at the end of September - mid October I would highly suggest it. We even have a name for this season: Leaf Peeper Season. Yup, it's for all you out-of-staters who trek up to here to see our beautiful foliage. Foliage - Seriously the colors are remarakable. The trees go from bright green to yellow, orange, brown and red. And once the leaves start to fall, they lay on the ground like a blanket which you can rake up and jump in. Jeans- Yup that's right! In Maine we pack our jeans away in late March (sure it's still 50 degrees but we're tough) and throw on our shorts. We try to eek out every second of summer since our season is so short. But when it is time to step back into those jeans, it's as if you are reuniting with your best friend. Scarves- I. LOVE. SCARVES! I love wrapping them around my neck to keep warm. I love them as an accessory, I love them when I don't have a tissue...oh wait...please don't tell! I just love them, and boy do I have more than my fair share! Oh and they look so cute with jeans! Hot Cocoa- Ahhh yes! I do love to take a break in the afternoon, fill a mug with hot cocoa, and lounge in my scarf and jeans. 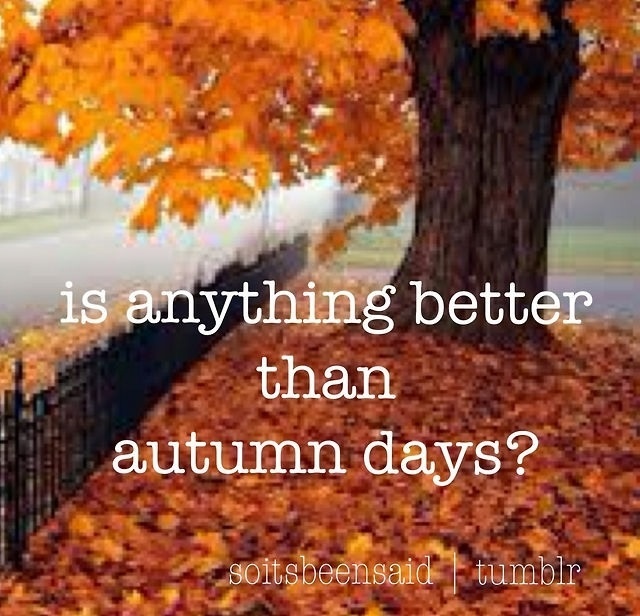 Or taking it outside to sit under one of those colorful trees and watch summer quickly slip away. It is a quintessential autumn drink. Apple Picking - One of my all time favorite things to do! I posted about it here. What an amazing adventure if you have never gone before. And for those who have, you know exactly what is to love about it! Oh and all the delicious things you can make with this fresh apples. Mhmm. Crisp Air - I love being able to sleep with the windows open and a/c off wrapped in my nice big down comforter. I love having my sunroof open with no humidity. It is so refreshing, it's as if the air is cleansing itself of it's summer heat and starting over. County Fairs - I am not a Fair person in general. I don't like the creepy carnies, the dirty dangerous rides, or the heavily greased food. But I do have a soft- spot for the Fryeburg Fair. It is the last Fair of the season in Maine. It falls in late September into early October. What I love is that it is held in a small town right on the New Hampshire border (hello outlet shopping!) and that it is a beautiful drive to get there. It is nice and chilly when we go so I can drink my hot cocoa, breath in the crisp air, wear my jeans and scarf, all while driving through western Maine looking at all the foliage. All my autumn favorites wrapped up into one delightful day! I could go on an on about what I love. But then I would be experiencing it for you! A Maine autumn is something you need to feel and see for yourself. I'm on Long Island (NY) and the one thing I love doing in the Fall is taking a drive to my aunt's house. It's about an hour or so north of NY City. The mountains are absolutely beautiful this time of year! I saw that last weekend on a trip upstate NY for a wedding. Tina thank you for stopping by! I loveeeee the fall festivities!! We just had Apple picking Sunday last weekend which is so much fun! I bet upstate NY is just beautiful! Enjoy these wonderfully short months! Stopping over from Scattered Seashells -- and I just HAD to start following! I was born and raised in small town Maine, spent my last four years there in Bangor at school ... and miss Autumn the most! There just something different ... special ... about the air in Maine come early fall! Hi Ashley thank you for stopping by!! Did you go to UMaine? I absolutely agree that there is something different about the Maine air. I wouldn't trade it for anything! I hope you are still able to enjoy it :):) I am a little north of Portland, and the leaves are now just starting to change!